This is simply a way of stating the law of conservation of energy as applied to heat and mechanical work changes. The equation must, of course, be treated algebraically, i.e., heat outflow and work done by the system would be written with minus signs. The word system in the above equation refers to any body or device which is involved with heat, work, and energy changes. The team turbine discussed on page 79 can be taken as a practical example of such. Before concluding this chapter it will be useful to add a final comment. Work done on a body mayor may not change its internal energy. 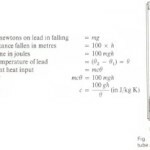 For example, a frictional force acting through a distance on the body will do work which is transferred to internal molecular energy and this will have the same effect as heat transfer, i.e., it will produce a rise in temperature. By contrast, the work done by a force in lifting a body above the earth’s surface will be transferred to gravitational potential energy of the body as a whole without affecting the internal energy of its molecules. If, however, the body is now allowed to fall, its potential energy will be transferred to internal energy in the body itself; to the ground at the place of impact; to the air through which it fell, and lastly to a little sound energy which is mechanical molecular energy transmitted by longitudinal waves (page 314). Finally, it must be noted that while the bulk of the energy will be transferred to internal energy in the body, the sum total of this together with the other parts mentioned will be conserved and equal to the original potential energy.